Looks easy enough. 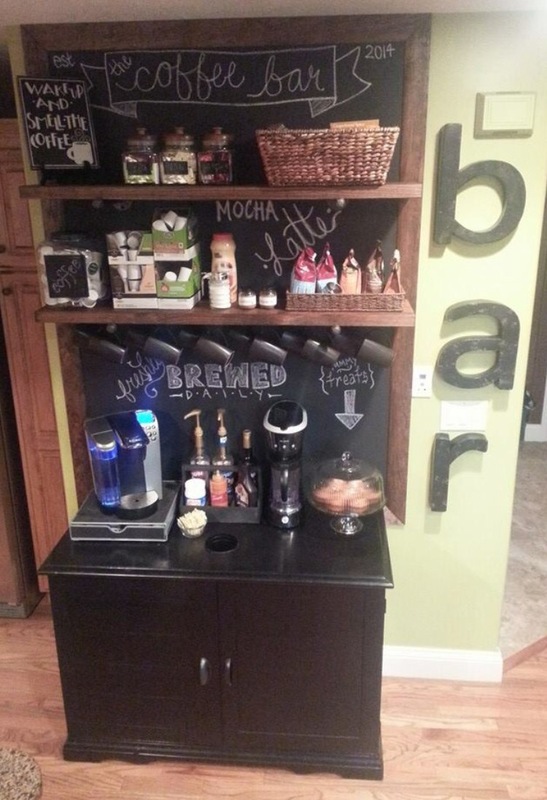 I have a wall between the kitchen and nook area that is perfect for this nifty project. First task, chalkboard paint. I used a tape measure and just guesstimated how wide I wanted this to be on the wall avoiding the switch plate side of the wall. Two top marks, two bottom marks then connected them using a level to make a rectangle. I taped the exterior of the rectangle with painters tape and used a foam roller to paint in the rectangle with chalkboard paint. About three coats was all it took. Then I removed the painters tape. I decided to use galvanized plumbing and stained 2 X 10 boards for my shelves (thank you Pinterest). I found my plumbing at Home Depot. It is a bit costly but looks fantastic. The floor flanges were almost $5 each and I needed 4. These are anchored to the wall on the studs. Not all of the holes hit the stud so the others are anchored with plastic wall anchors from Home Depot. Once the flanges were installed, I screwed in the threaded straight galvanized pieces that will hold the resting shelf. These arms are capped with a galvanized threaded plumbing cap. (I guesstimated on my shelving height so there is no rhyme or reason to where they were positioned, I just eyeballed what height I thought would work best. My shelves are spaced just under 2 feet apart. 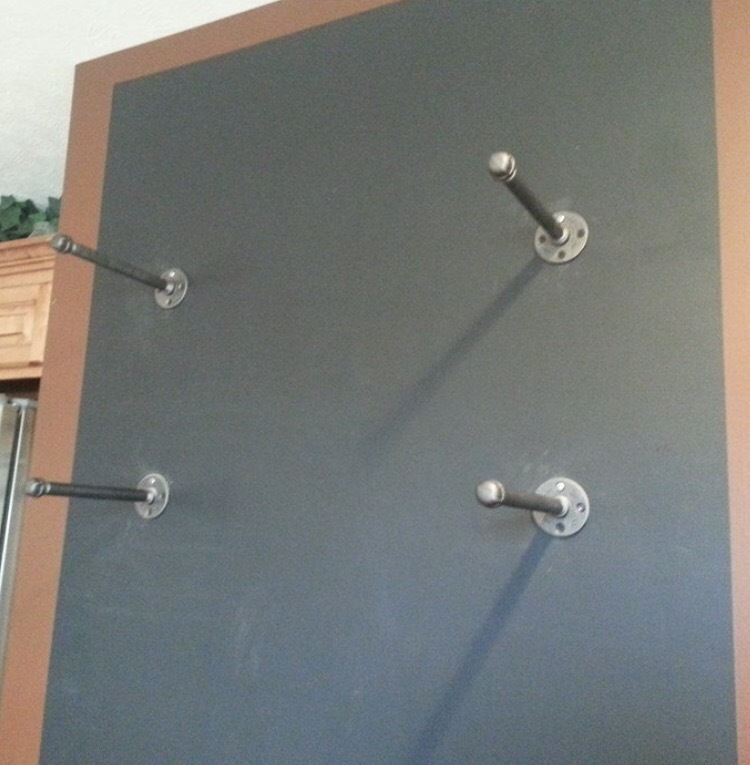 I placed the flanges 12 inches inward from the outer edge of the chalkboard. My top shelf is 24 inches from the ceiling. The bottom of my bottom shelf measures just under 3 feet from the bottom of the chalkboard.) 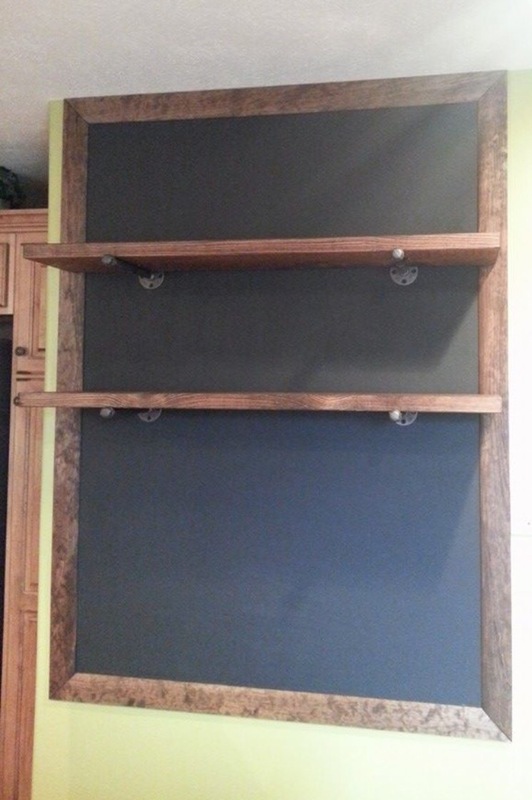 I cut my 2 X 10 boards the exact length of the width of the chalkboard and stained them with Rustoleum Honey stain. 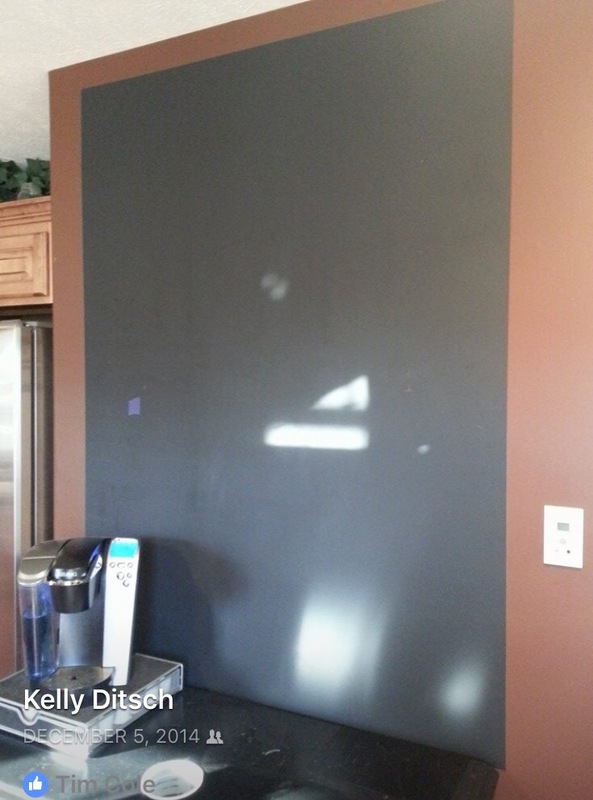 I cut 1 1/2 inch trim to frame the outside of the chalkboard and tacked it up with my brad tack nailer after staining. For the base, I found an old record cabinet at Goodwill for $50. 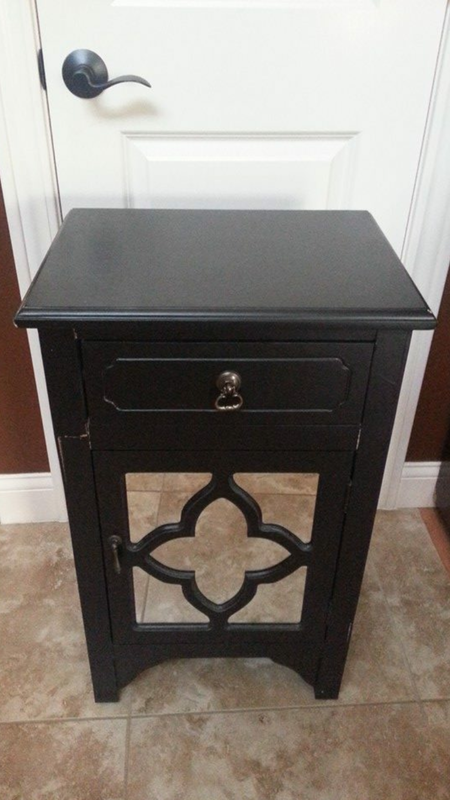 I lightly sanded it and painted it black. 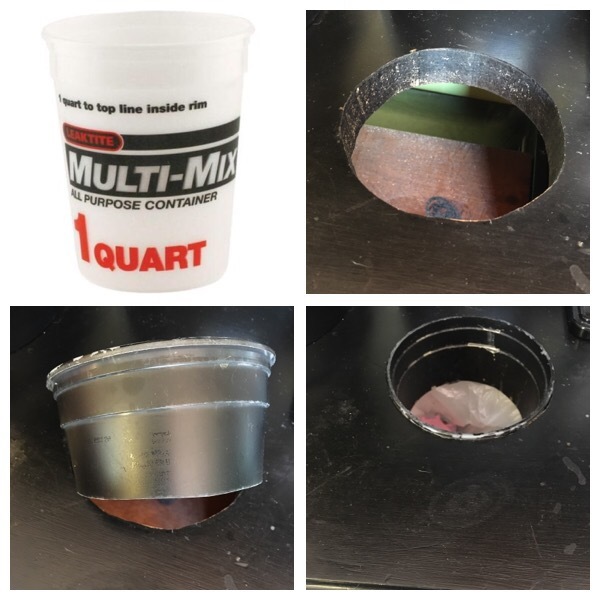 I had a small plastic Home Depot container laying around that I decided to utilize as a trash chute. 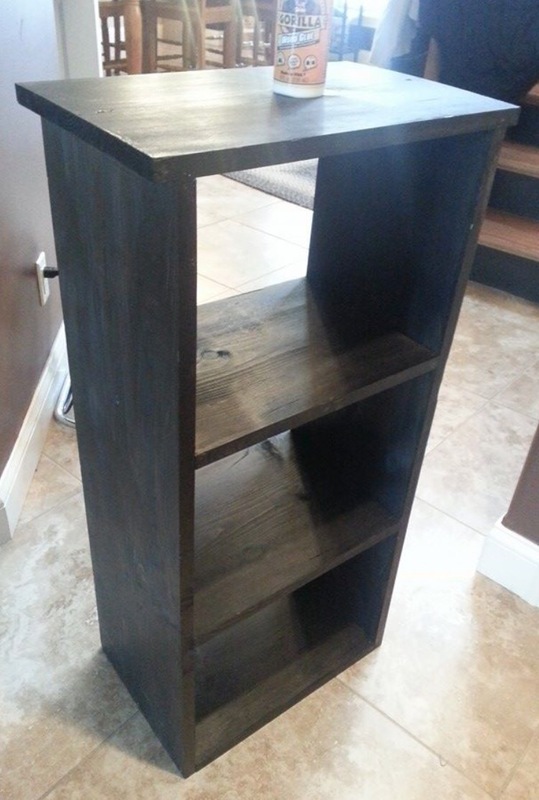 I cut it in half and threw the bottom away then spray painted the top chute piece I saved with black spray paint. 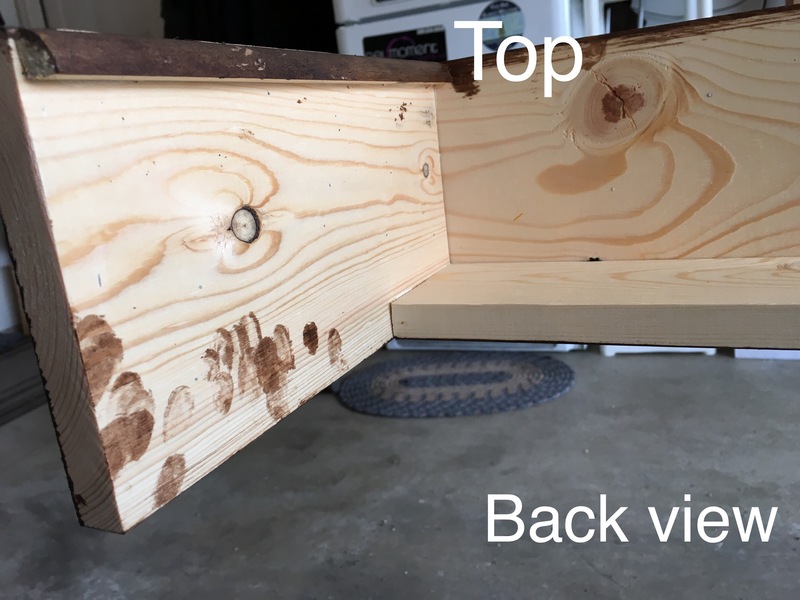 I traced the top rim on my bar top and used a jig saw to cut out the hole then set the plastic chute in the hole to line it. I placed an ice cream bucket underneath the chute on the top shelf to act as my trash receptacle. 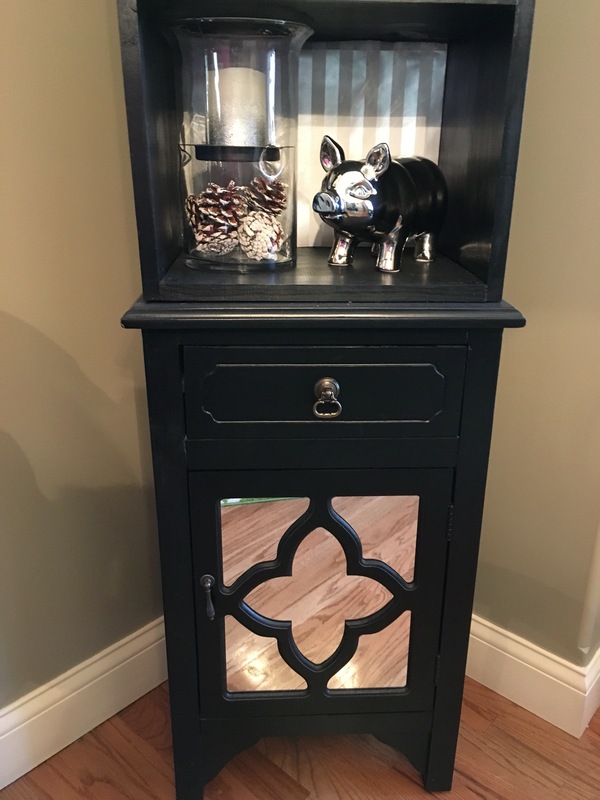 The record cabinet is perfect for this project. 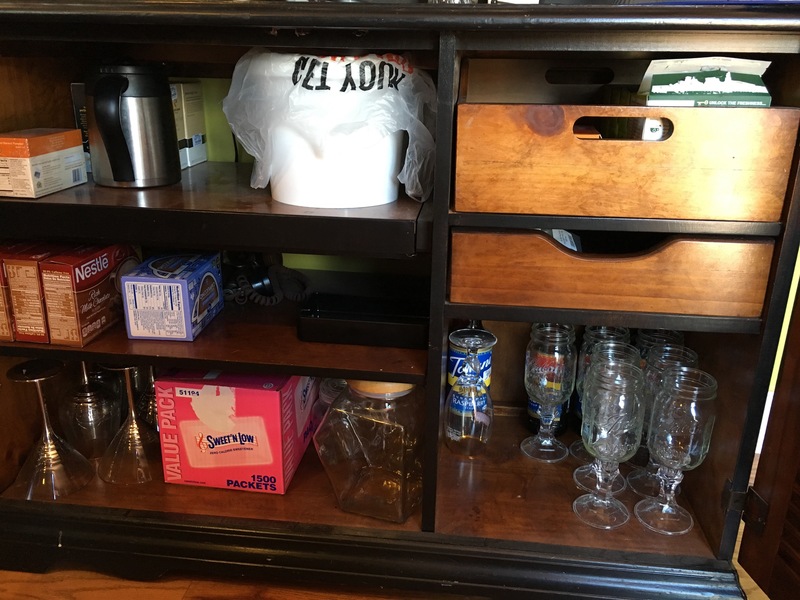 I has sliding shelves and drawers, plenty of storage and a built in plug in in the back! Next, I installed staggered cup hangers under the bottom shelf and installed pipe brackets over all 4 shelf arms to attach the shelf board to the pipe in order to prevent shelf lift and accidents (these pieces all had to be spray painted black because the brackets only come in silver and the cup hangers I had were gold). 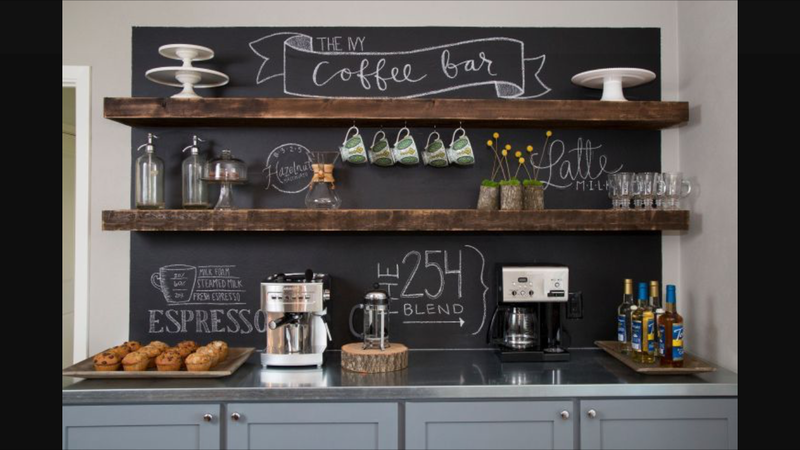 I free handed the chalk graphics using my inspiration picture as my guide and then I started stocking shelves. Here is the final result. 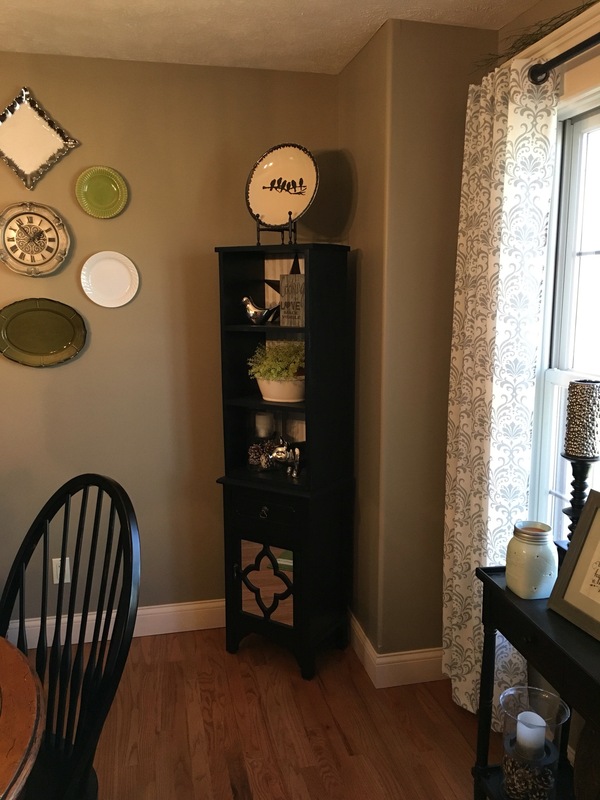 I am no Joanna Gaines, but I love the finished project. 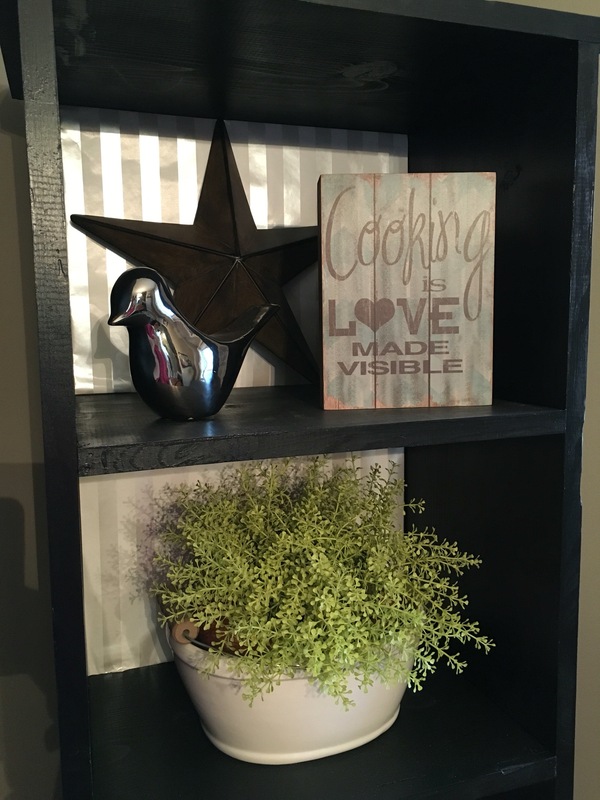 What’s your “Joanna Gaines project”? Now, to me, a 4 bedroom home means that at LEAST 4 people are going to live in the home, so we will need to fit an average of 15 pairs of shoes and 12 jackets/coats (not counting the room needed to stash the belongings of visiting guests). In other words, this builder failed. 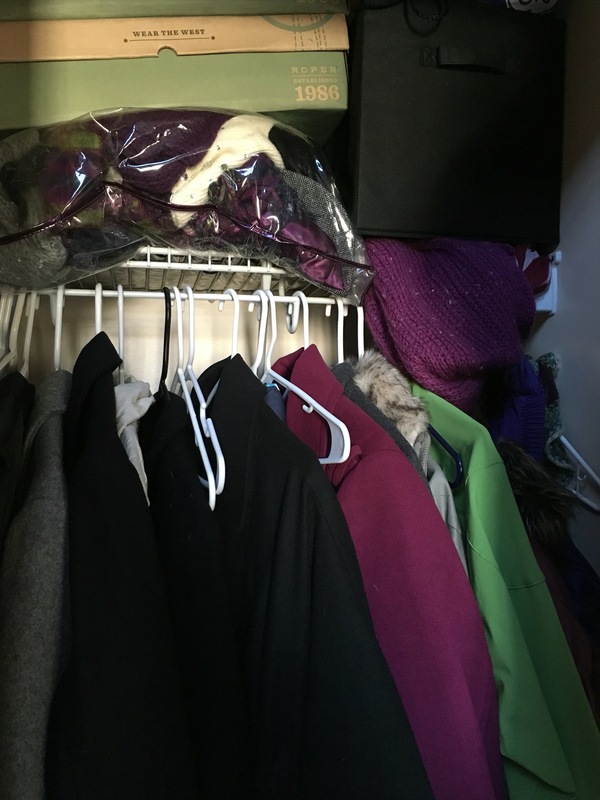 This size coat closet belongs in an efficiency apartment. Obviously, we need more storage. So, though I was not thrilled, using the space on the adjoining exterior wall was my only option. The idea was to build something to hold coats, shoes and other necessary accessories; scarves, hat, gloves. I decided on a simple design with minimal materials. 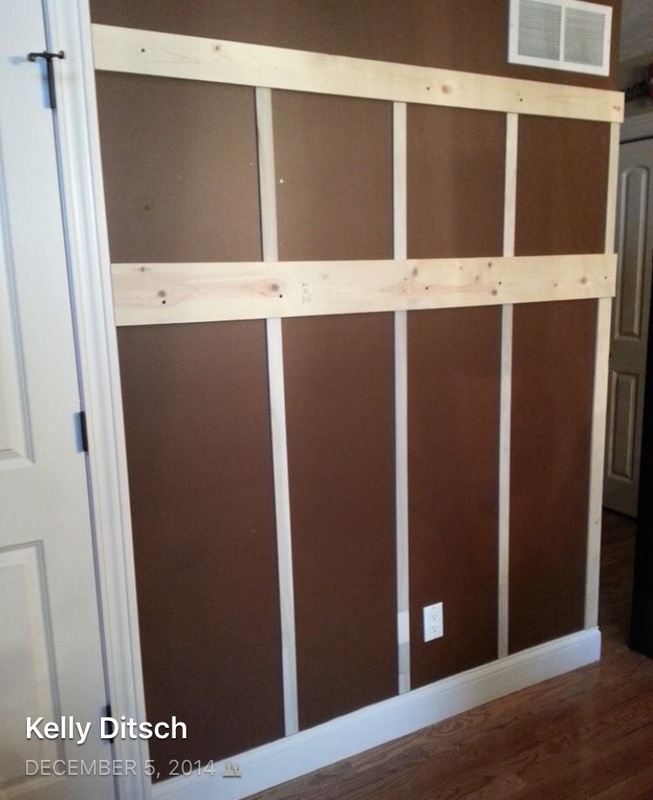 I cut a 1×6 board according to my wall measurement and attached the board to the wall studs. This board will hold my coat hooks. There was no rhyme nor reason at what height I placed this, it was more of a “what height would work best for the kids” and up it went. 52″ from the floor to the bottom of the 1×6 is what the measurement ended up being. My wire baskets measure 14″ high so I left a 16″ gap between the 1×6 and top 1×4 board that the baskets will hang from. The 1×4, once cut to size, was also attached to studs. The precut slats I hung starting at the end opposite of the existing closet where the walls come together. Once installed the full length of the rack, I measure the area between, divided it in half and that is where I racked up another length of slats. 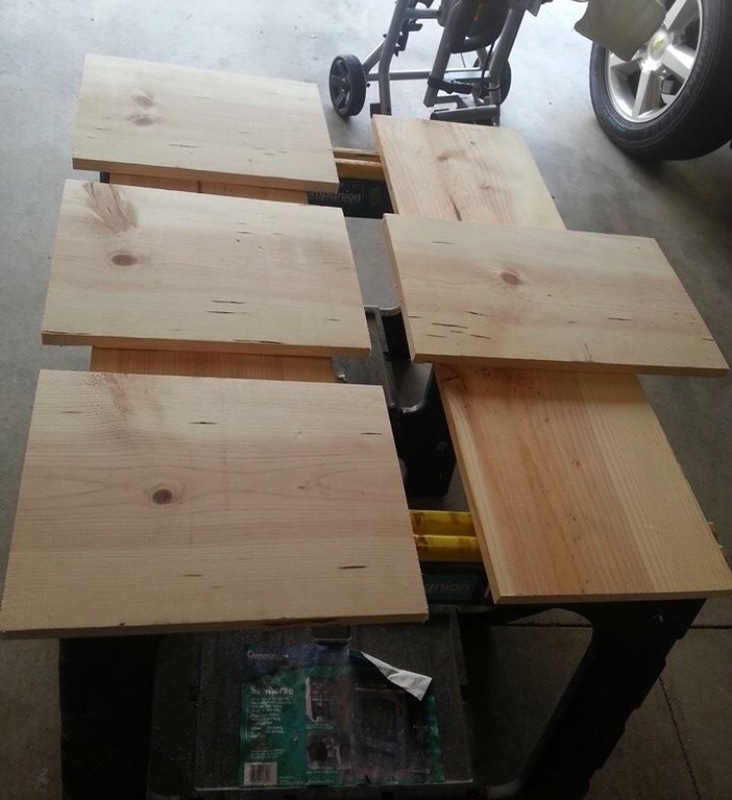 I repeated this method on each side of the middle slats to place two more lined sets of slats. I used wood filler to cover the screws, and the seams between the precut slats. 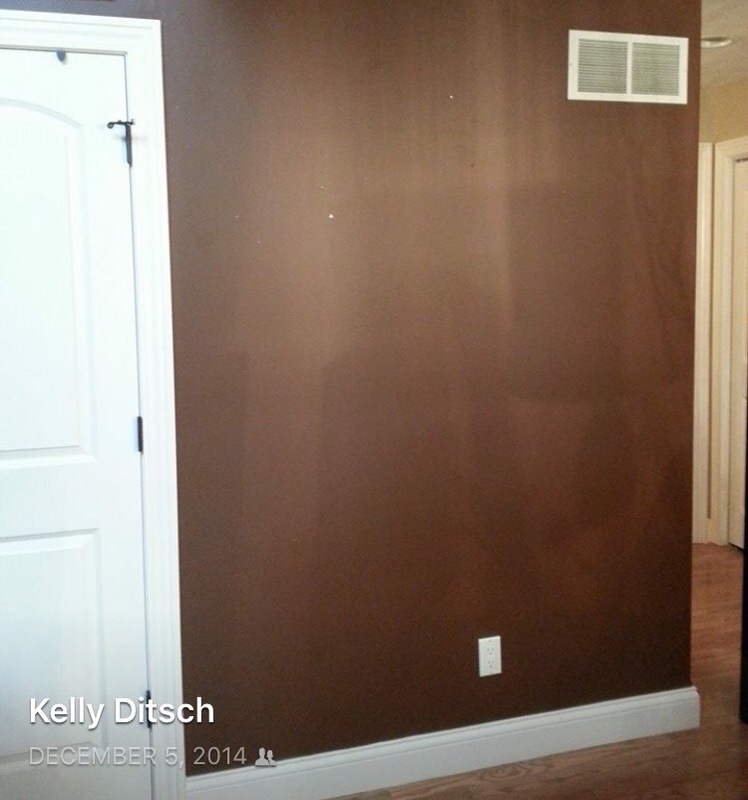 I then painted the wood and the wall between with the same color of paint that was used on the trim. Luckily, there was plenty left in the can that was left in the basement when we moved it. 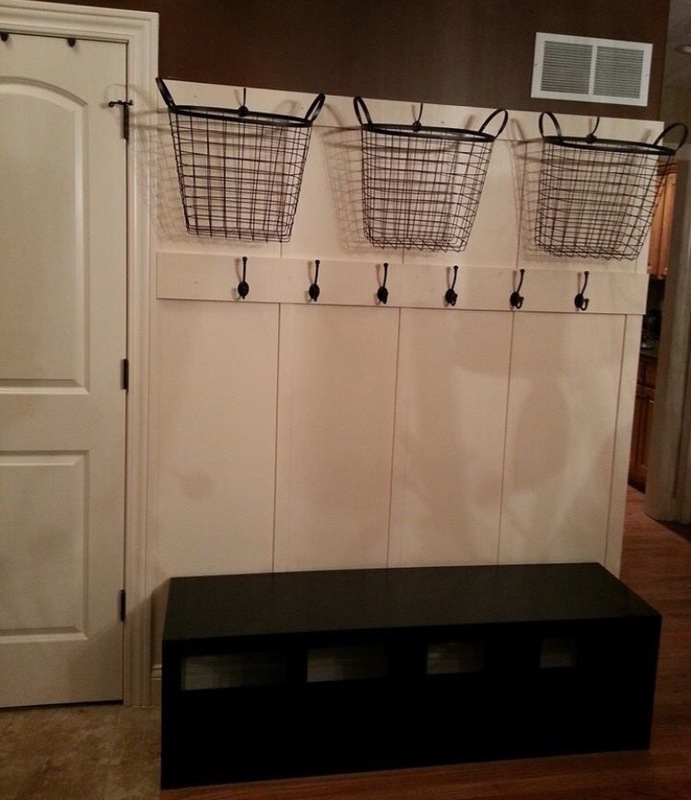 Next, I installed the coat hooks using a measuring method similar to the slat install method. I install both end hooks, then the middle and work my way out. It’s easier to me doing it that way. 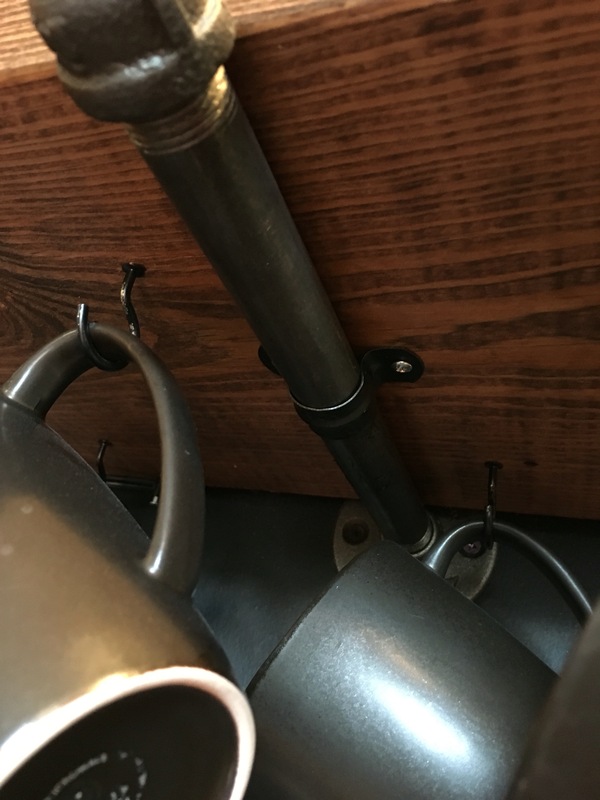 The basket hooks were hung by simply dividing the top board into 3 and tacking a hook on each mark. The 4 compartment unit that I am using for shoes is from the Better Homes and Garden collection at Walmart. I inserted black fabric bins for the kids to hold their shoes in. 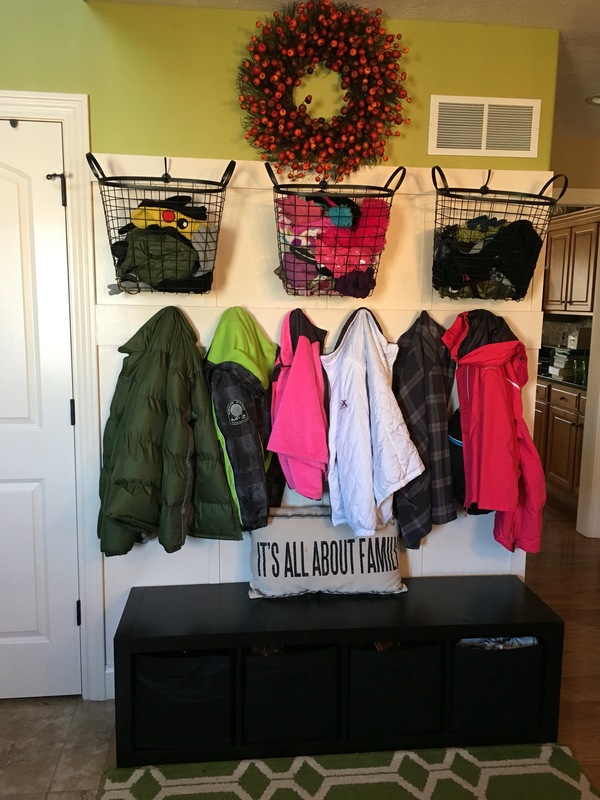 Each kid has two coat hooks; one for coat, 1 for book bag; and each kid has their own basket and shoe box (my teenage daughter has 2 shoe boxes). We love it. It certainly makes more sense than what we were given! What builder “boo boo” was your home designed with? 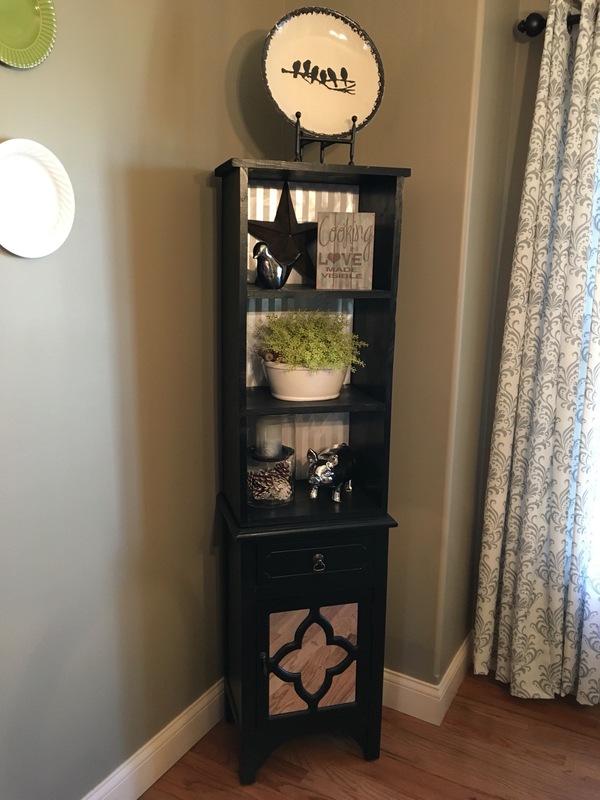 Whenever I look to change something in my home, my ultimate goal is to design something that isn’t permanent in case the next homeowner isn’t a fan. 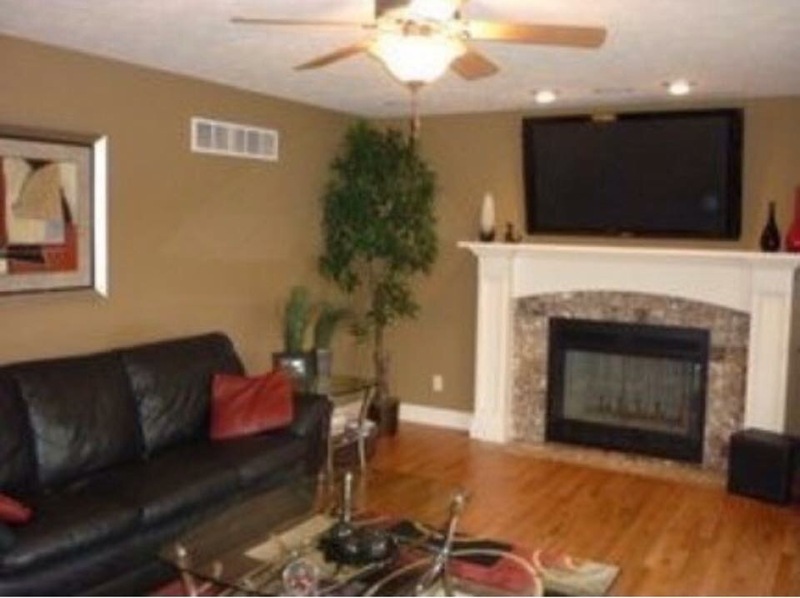 We relocate every few years so we aren’t in one place for long and I’m always afraid people will hate my design ideas and I want the change to be quick and easy to make my home appeal to them. 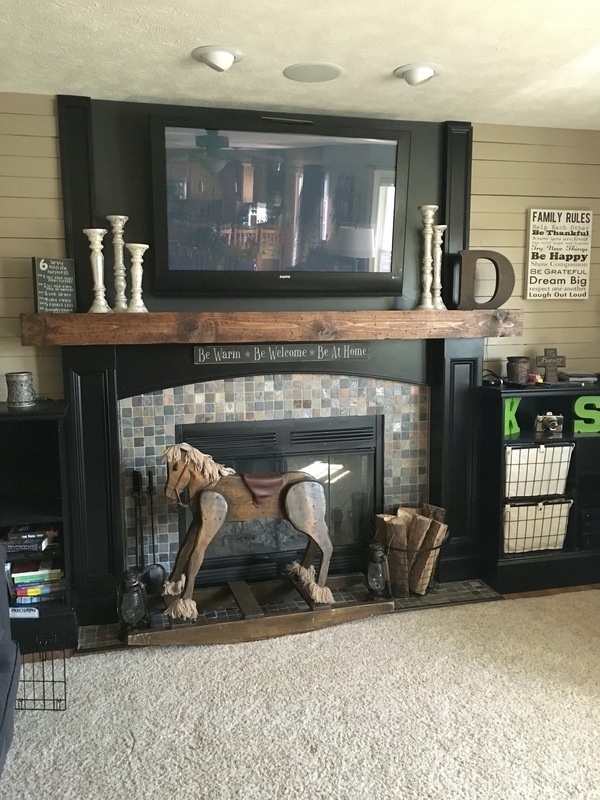 This weeks project was our fireplace mantel. I wanted something more rustic than what we have. 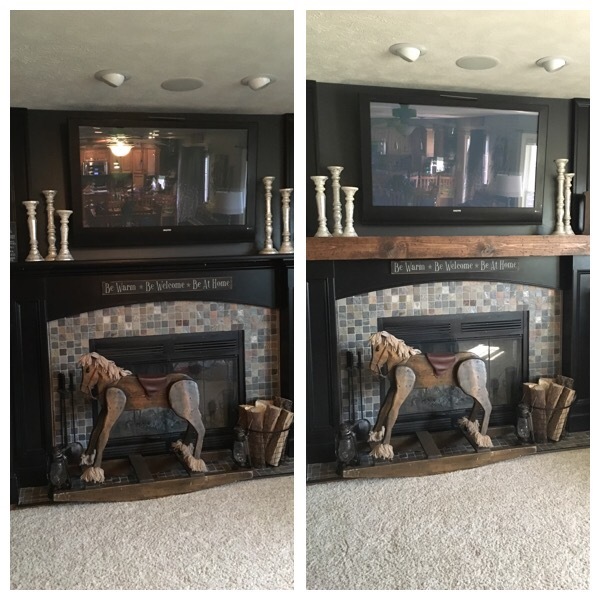 I have completely transformed the entire fireplace wall since we bought the house but I wasn’t 100% satisfied with the full result. Here is what the place looked like when we moved in: Cookie cutter, builder grade, drab and boring. This is what I turned it into: Much better. 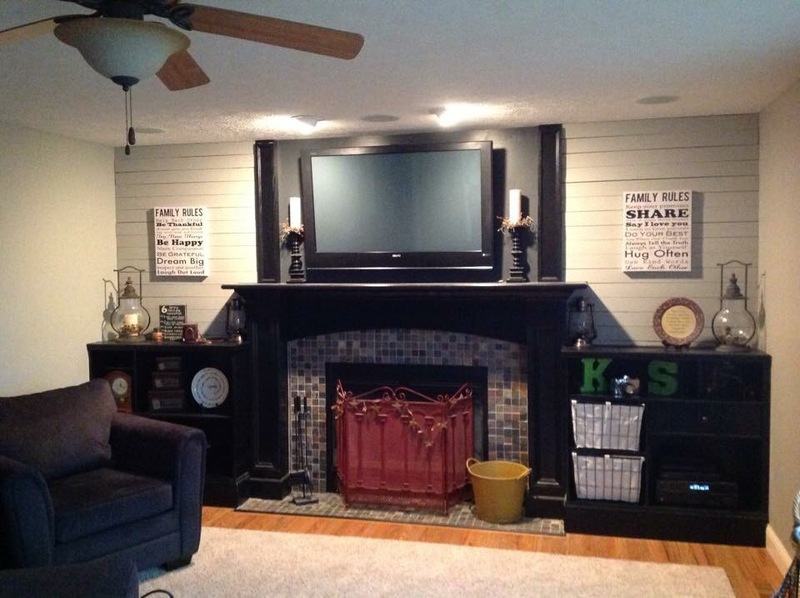 But, I still longed for another rustic element, like a large, bulky, rustic, distressed mantel. So, I went to the drawing board and decided to make a sleeve of sorts that just slips over my existing mantel that can be removed without effort. The piece is held together with wood glue and brad tacks. 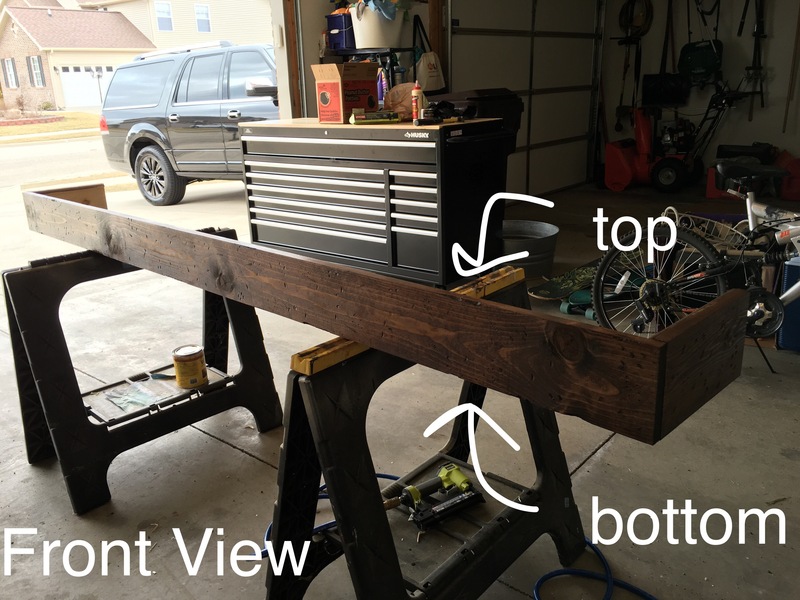 I cut the two 1×6 side pieces the exact length that my mantel sides measured. 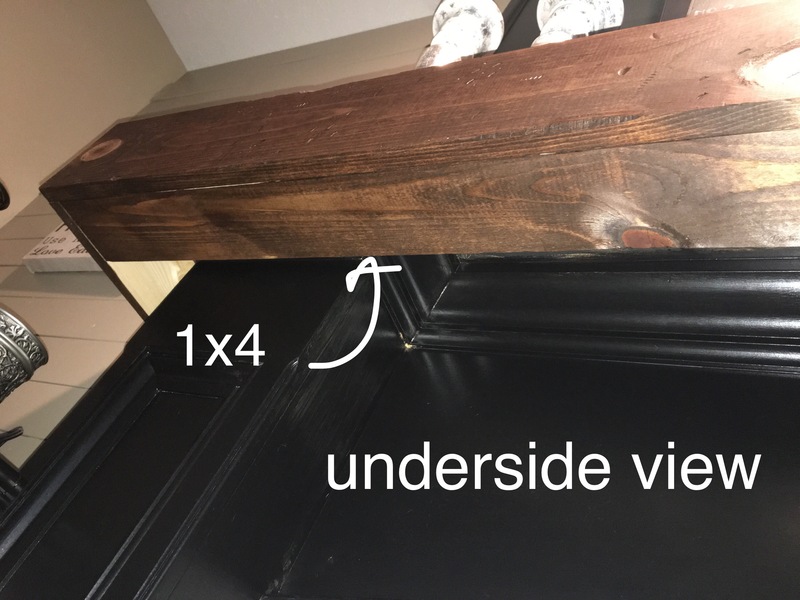 My 1×6 front piece was cut 1 1/2 inches longer than my front mantel measurement so that the end pieces cut edge was covered and not visible from the front. I glued and nailed these piece together. 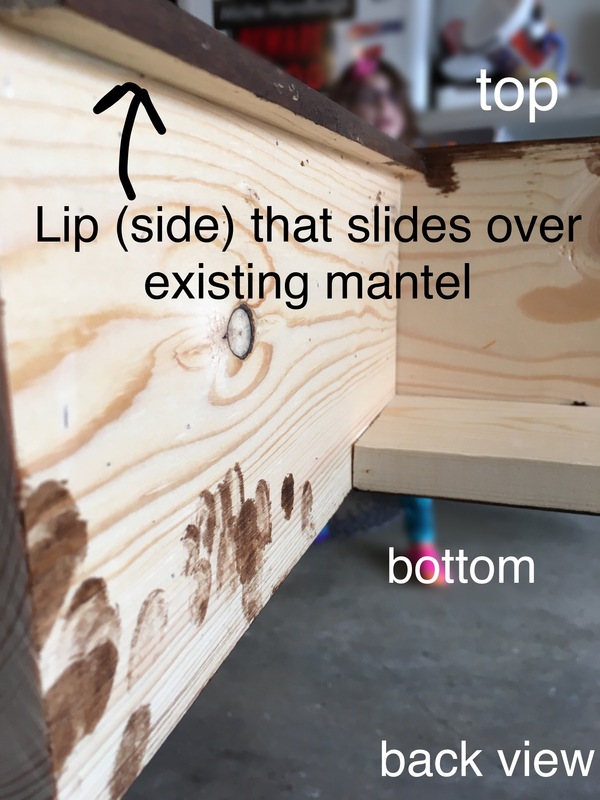 My 1×4 board was cut the same length as the mantel and that is the underside of my box to cover the gap underneath. Also glued and tacked in. 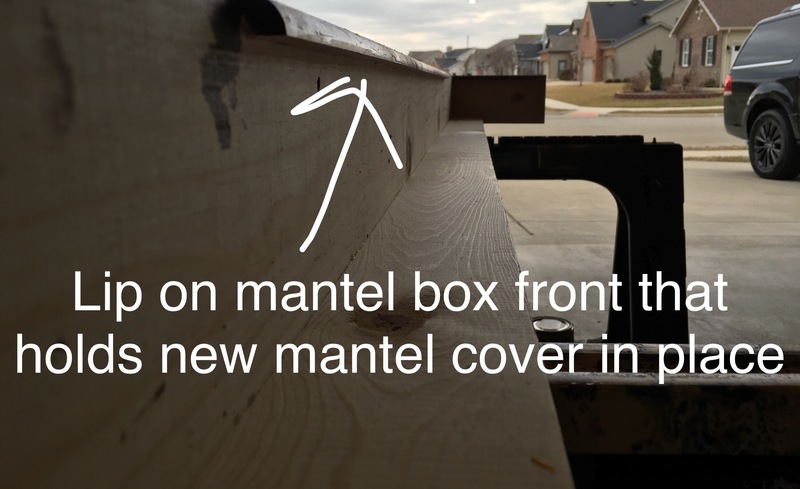 The 1/4″ round is what holds the mantel cover over the existing mantel. 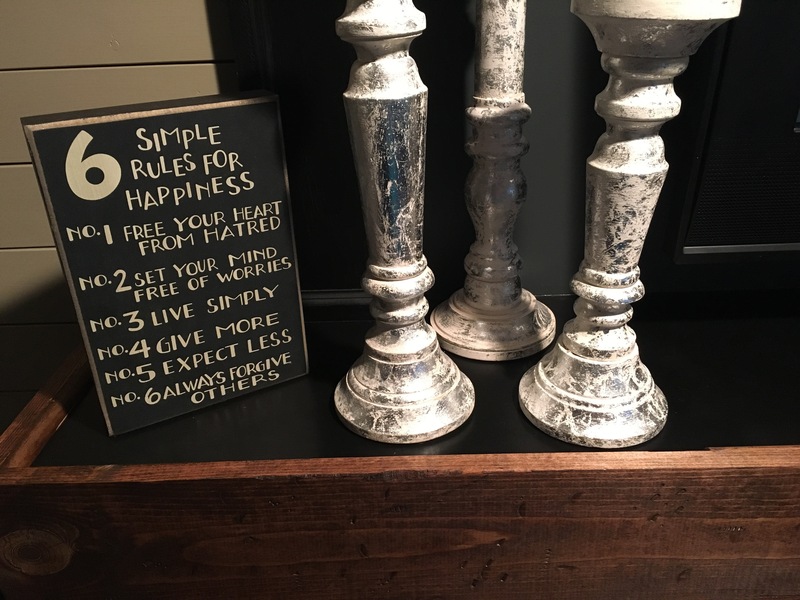 They simply slide over the top of the existing mantel and hold on the decorative rustic piece. 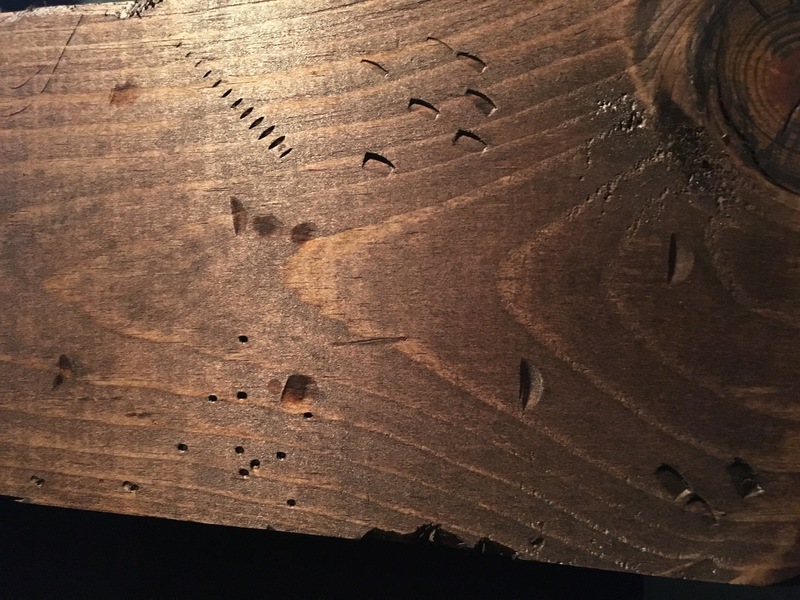 I distressed the wood pieces by beating them with a hammer, scraping out chunks with a chisel, tapped a screw end to make worm holes, tapped screw head and thread marks into the wood and then stained with Rustoleum “Honey” stain. 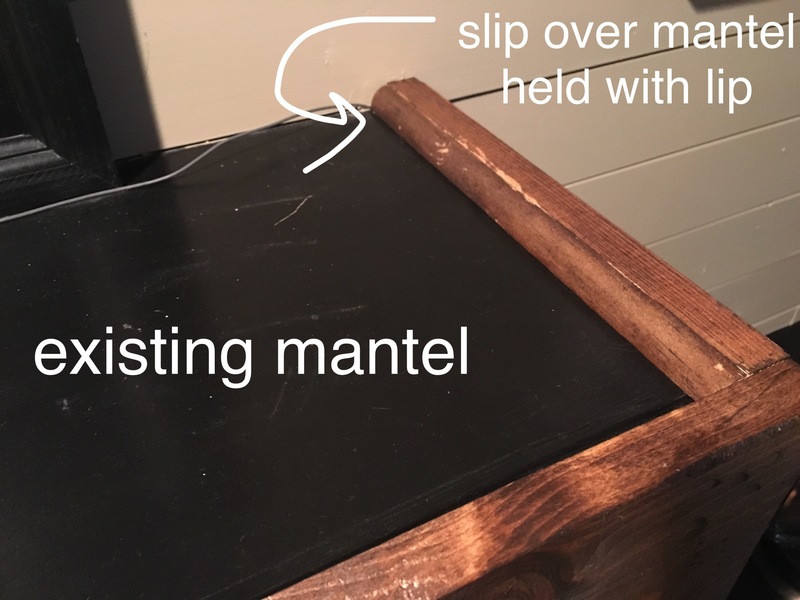 Then, mantel cover just slides over existing mantel. Perfect fit. Now, if the next homeowner hates it, they can simply slide it off and trash it. That’s my kind of DIY.